Did you know that oral disease is the most chronic childhood illness in the United States? Even though my children and I go for our regular six month dental check-ups, I'll admit that I'm not always faithful about brushing my teeth after every meal. However, I make sure that both of my children brush and floss regularly, after breakfast and before bedtime always, and after lunch whenever possible. As a mom, I know it's my responsibility to set a good example for my children. That's why I have decided to take part in the Listerine 21 Day Challenge with my children. I'm going to "lead by example" and show them that by making our oral health a priority, we can not only make a difference for ourselves but for the lives of other children as well. By brushing, flossing and using Listerine Ultraclean mouthwash twice a day during the Listerine 21 Day Challenge, we will be helping children in need across America receive much needed oral care through the Smiles Across America program! Did you know that brushing alone misses 75% of your mouth? Disturbing, isn't it? Listerine antiseptic mouthwash cleans virtually 100% of your mouth, for healthier gums! Over the next 21 days, my main focus is going to be flossing nightly and using Listerine mouthwash twice a day. 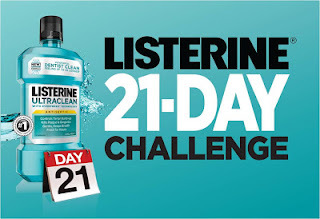 I highly encourage you to join the Listerine 21 Day Challenge. For every person who signs up for the challenge, Listerine will donate $6.40 (up to $64,000) to help Oral Health America's Smiles Across America program. What is your biggest oral care challenge... brushing, flossing or rinsing? 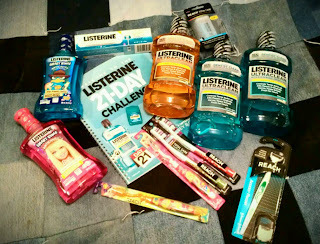 I received products from Johnson & Johnson Healthcare Products Division of McNeil-PPC, Inc. and the Motherhood as part of my participation in the Listerine 21 Day Challenge. All thoughts and opinions expressed in this post are my own.